WASHINGTON (CNN) -- While the military has instituted dozens of programs to help troubled soldiers with post-traumatic stress, brain injuries and other problems, some troops have privately told the nation's top military officer they feel they are treated poorly because they are wounded, ill or injured. 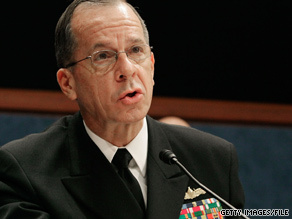 Adm. Michael Mullen is reporting that some wounded troops feel that they are treated poorly. In an April 19 confidential memo to Defense Secretary Robert Gates, Adm. Michael Mullen -- chairman of the Joint Chiefs of Staff -- outlined a number of problems he observed during a trip to several military locations in Texas. CNN obtained the memo from a military source, and both the Army and Mullen staffers confirmed its authenticity. During the visit, Mullen met privately with about 30 wounded troops at Fort Hood, Texas. "The wounded expressed concern that, at Fort Hood, they were stigmatized and treated as lesser Soldiers for being wounded, ill, or injured," the memo said. The troops had previously been treated at Brooke Army Medical Center in San Antonio, Texas, where they said they were a higher priority for that staff, than the Army staff at Fort Hood. "The wounded, ill, and injured also feel guilt for not being with their operational units. Unfortunately, the operational units have generally severed relationships with them," Mullen said. Senior enlisted troops recently returned from the war zone also told Mullen "psychological health assets in theater were overwhelmed during their most recent deployment." Several sources confirmed that the Mullen memo concerned Gates so much he asked Gen. George Casey, the Army chief of staff, for a response. A spokesman for Casey confirmed that Casey and other Army leaders continue to be aware of these general concerns and are focused on a number of programs to help soldiers. The memo, however, provides a unique insight behind the scenes into what soldiers are privately saying. Mullen said the troops also told him "they believe they are being denied second opinions on their medical conditions by the military medical professionals who are treating them." CNN recently visited Fort Hood to observe several programs under way to treat returning soldiers and improve their resiliency to battlefield stress. Mullen has spoken about how Fort Hood has succeeded in dramatically reducing suicides and traffic accident deaths among returning troops. In the memo, Mullen commends Fort Hood commanding general Lt. Gen. Rick Lynch for steps he has taken to provide programs to help troops. But the memo is a private indication of some of the deep problems the military is still facing. For example, Mullen noted the three-week course at Fort Hood to treat mental health symptoms can only accommodate eight soldiers at a time. Fort Hood on average has more than 50,000 troops on base at any one time.